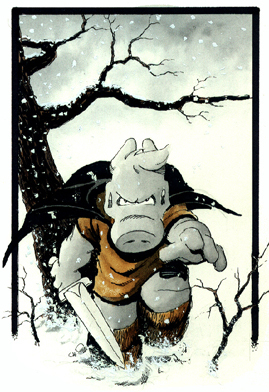 As if in answer to my silent prayers, formulated by unuttered for the first time this very week, Cerebus is now starting to be released on Comixolgy. It’s just the first two issues of the High Society story arc so far (though the first ish is free), but one presumes there’s much more to come. I never managed to read much Cerebus back in the day and I’ve always wanted to rectify that. But I’ve got so very little room left on my shelves that I’ve avoided buying any of the phonebook compilations. Hence my hope that this classic series would see digital release someday. Sometimes the universe hears your thoughts and does something with them. So if you’re all into the idea of digital comics (whether viewed on a desktop/laptop or some kind of tablety device) and are also interested in reading the adventures of the earth pig, rejoice along with me. This entry was posted in Appendix N, Comics on October 10, 2012 by the venomous pao.